When sprucing up your interior space, flooring can be thought of as both a structural necessity and a source of decorative potential. While there’s a lot to choose from in the world of flooring, there is space to consider flooring accessories like area rugs to bring a decorative contrast to your flooring choice. Especially when it comes to wood and tile flooring, area rugs are an excellent way to add style and a customized look to your interior décor. Decorative accents can really make an interior come to life, and the best kinds of accents are the ones within the boundaries of your budget. Some of the best sources of decorative accents, which also serve as a means to promote comfort, are area rugs. Some of the most sought after area rugs are those made from bamboo – a durable and uniquely attractive alternative to traditional, and often more expensive, synthetic fiber area rugs or cotton area rugs. Bamboo area rugs can lend a space an air of laid-back elegance, which can promote feelings of comfort for those living and working in that interior. The versatility of bamboo area rugs is notable as they are able to serve both practical and decorative purposes. Along with acting as a focal point of a room, they will compliment a wide range of flooring options such as ceramic tile, laminate, and bamboo planks. That’s not all, bamboo area rugs are often used to accent a room with wall-to-wall carpeting, giving an interior a more varied palette of textures. In terms of design, bamboo flooring area rugs offer a tropical touch, with an air of sophistication that is relaxed and casual at the same time. These area rugs have a subtle influence that can become a feature of the interior, or can bring out the beauty in other featured elements. Bamboo area rugs are commonly available in two basic styles: wide strip and narrow strip woven. The wide strip variety appears much like a bamboo flooring board with the bamboo mounted on an anti-slip backing, which anchors the rug a more securely onto the surface of your flooring. Narrow strip woven bamboo area rugs are similarly designed with an anti-slip backing, but with a more tightly wound design of interlocked bamboo strands. Both varieties are decorative additions to most indoor settings. There are two levels of warmth to be gained with strip style bamboo area rugs. First, the natural blonde and carbonized caramel tones of the bamboo plant exude a visual warmth that is unique to this grass-derived rug option. Since it is a natural product that only undergoes basic processing, bamboo area rugs lend a sense of elemental beauty common to products marked by their natural origins. Second, strip style bamboo area rugs offer warmth underfoot, without the problem of holding unwanted materials in its fibers. This means that at least two requirements of comfort are met, both in terms of a warm surface to walk upon, as well as less sneezing when it comes to dust and other elements on your area rug. A common problem with traditional area rugs is the tendency for them to pick up electron charges and carry them to those who walk on them. To be surprised by an unwelcome zap gained by the simple act of walking on your area rug and then touching a light switch or metal object can be frustrating to say the least. 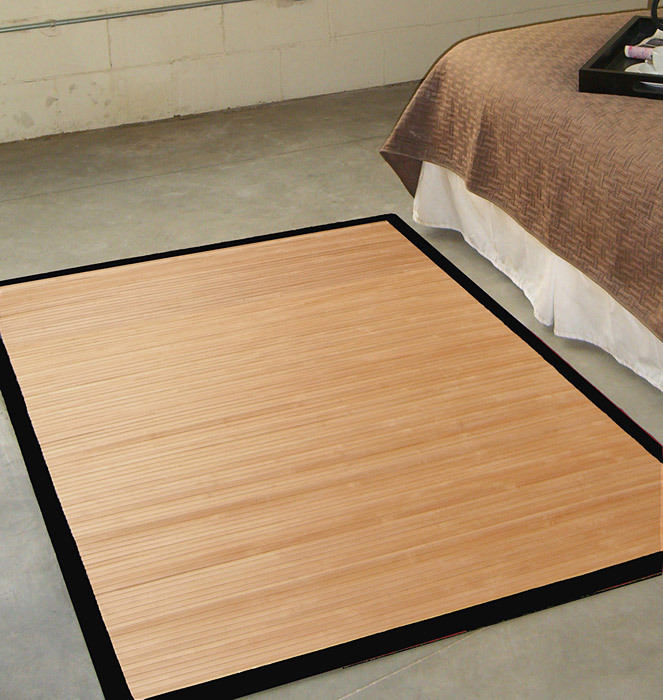 Bamboo area rugs do not conduct electron charges like many traditional area rugs or carpeting do. Not only is there no annoying zap factor, but there is also no need to invest in anti-static treatments which other area rugs often require. Limitations of bamboo area rugs are similar to those of the flooring boards and can generally be understood by simple common sense. Most of these limitations center around moisture; it is best to keep bamboo area rugs away from excessive moisture common in bathrooms, laundry rooms, and (in winter months particularly) foyers. Therefore, it might be a good idea to place them in living rooms, bedrooms and hallways, where the likelihood of water is least likely to be a problem. Bamboo is a reliable material for both flooring and area rugs. It has been proven time and time again as an exceptionally durable, attractive, and long-lasting option for those who appreciate a simple, yet elegant, natural look for their interior. Bamboo area rugs, much like bamboo flooring boards, are continually gaining popularity with discerning interior design experts and homeowners alike. Consumers are taking advantage of all the characteristics for which bamboo is becoming known: hardness, environmentally sensitive, and a range of rich color options. For an area rug that will stand out as a feature of an interior, or blend in and embellish existing colors and textures, bamboo area rugs will reveal a whole new set of design possibilities!